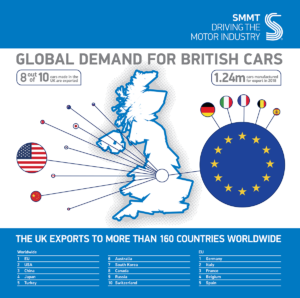 SMMT has published a series of issue papers looking at the impact of the UK withdrawing from the EU on the UK’s automotive sector. The single market and customs union create the conditions UK automotive needs to thrive. To avoid costly disruptions to vehicle manufacturers and their supply chains, and to safeguard the sector’s competitiveness, any alternative customs arrangements need to replicate exactly the seamless trading relationship that UK automotive currently enjoys with its largest market. The sector believes that continuing customs union membership is essential to achieving this ambition. Type approval exits to ensure that motor vehicles, trailers and their systems, components and separate technical units meet the necessary technical, safety and environmental standards in their respective markets. The European Union’s type approval framework is governed by EU Directive 2007/46/EC. Manufacturers who comply with this framework are eligible to sell their product anywhere within the EU single market without restriction. Their eligibility is determined by the outcome of tests, carried out by technical services and witnessed and approved by an approval authority. In the UK, the recognised approval authority is the Vehicle Certification Agency (VCA). The automotive industry in the UK is committed to further reducing the environmental impact of its products. Developing challenging, but realistic, targets for post-2021 is crucial to delivering the UK and EU’s GHG/CO2 targets, as well as ensuring the long-term success of the automotive industry, and the jobs and wealth creation it delivers. The automotive industry needs the UK and EU to agree urgently the terms of the Brexit transitional period. Should no transitional arrangements be agreed it would cause considerable disruption to the automotive industry’s integrated supply chains; limit access to the sector’s biggest market, the EU; bring an end to the sector’s preferential access to markets right across the globe; disrupt the manufacture, sale and registration of vehicles that have been type approved in the UK; and undermine the sector’s competitiveness right across Europe. The automotive industry is highly integrated and needs to comply with a large number of legal requirements throughout its complex global supply chain, with REACH, the Registration, Evaluation, Authorisation and Restriction of Chemicals Regulation, being one of the more challenging – further detail on REACH and its impact on automotive operations can be found in the Annexes of this document. The UK’s decision to leave the EU, therefore, raises the issue of how chemicals will be regulated in the UK in the future. 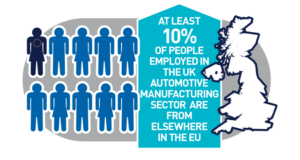 The UK automotive industry benefits from access to the skills and experience of EU and global employees. A flexible and moveable workforce is key to competitiveness and growth. As a fully integrated global industry we also benefit from UK staff being easily mobile and accessible within the EU. The European Union currently offers considerable funding to support research and development (R&D) both to automotive companies and their partners, including universities and local regions. The current EU framework programme, Horizon 2020 will disburse around £70bn of funding between 2014 and 2020, with around £6bn earmarked directly for transport. There are also other generic programmes within Horizon 2020 which the automotive industry benefits from. 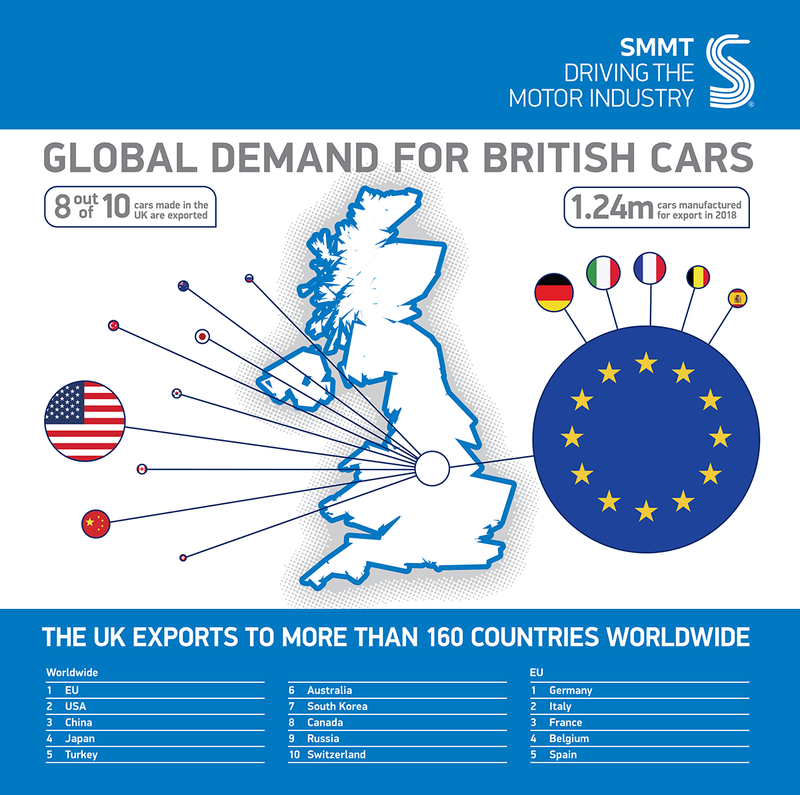 The UK automotive industry trades globally. It exports vehicles to more than 160 countries worldwide. The United States, China and Russia are the largest non-EU export destinations for automotive while Turkey, Australia, Japan and South Korea are also key markets. Rules of origin are the criteria needed to determine the economic nationality of a product for the purposes of international trade. These are important because alongside the value and the tariff classification of the goods, the duties or trading restrictions applied to products depend upon the country in which a product is deemed to have originated. Knowing where a product has originated from is essential in determining which trade rules (for example the tariffs contained in a bilateral trade agreement or multi-lateral agreement) should apply when importing or exporting a product. Rules of origin, therefore, have a key role to play in facilitating the application of trade policy instruments.